When Max was a newborn, his neurologist told us to expose him to as expose him to as many experiences as possible to help expand his mind. This was challenging when he was little, because his sensory issues made him afraid of crowds, noise and new places. Yesterday, it was clear just how far Max has come. All morning, he kept saying he wanted to go to New York City. On his wish list: a visit to a fire station, and steak. His usual preference is Dave for these joy trips, but Dave was zonked. So: Mommy and me it was. I booked a reservation at a steakhouse and off we went. The train ride there alone was a thrill. Max was in charge the second we stepped foot in Manhattan. 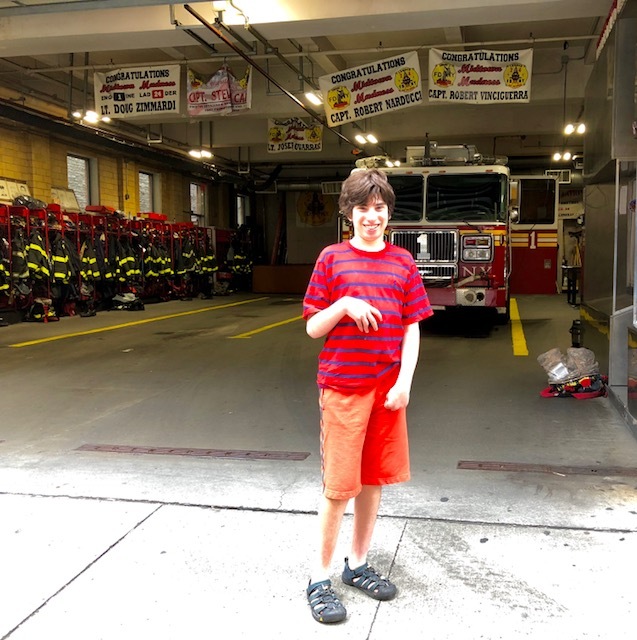 He directed us to the local fire station, where we met Firefighter James. When he asked me how old Max was, I said, "Ask him!" and he did. Max made conversation: He noted his plans to move to Orlando, because Disney World is there. He asked James if he'd been to Disney World. He asked if there had been any fires that day. After Max and I walked a few blocks, he asked to take the bus uptown. 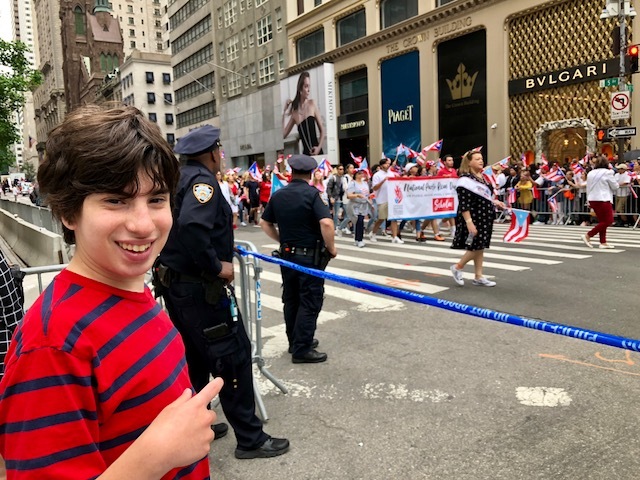 I hadn't realized that the Puerto Rican Day Parade was happening, and when our bus got rerouted we got off to check it out. 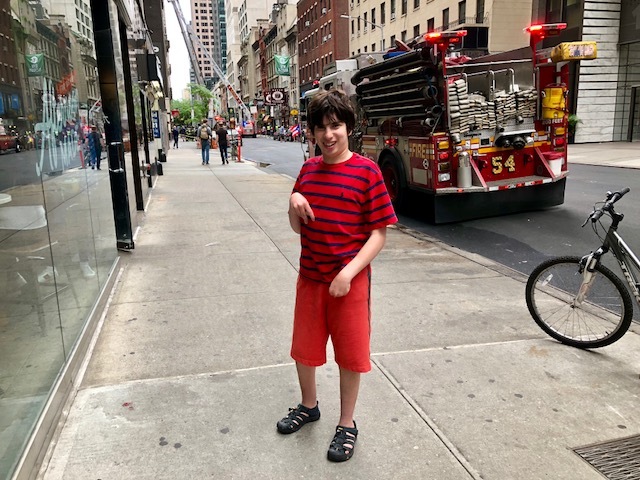 But first, Max spotted a few fire trucks on a street investigating a smoke situation. Bonus! As we watched the parade, Max waved at the people on the floats. 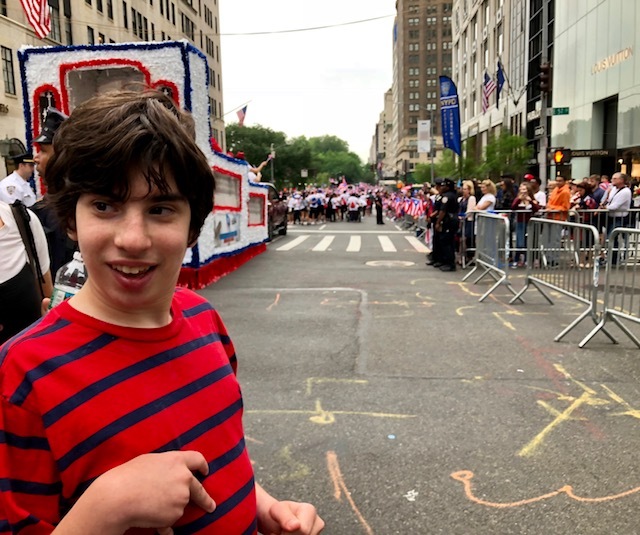 He asked if he could be in the parade, and I said those people had permission. He accepted that, notable for the lack of resistance. 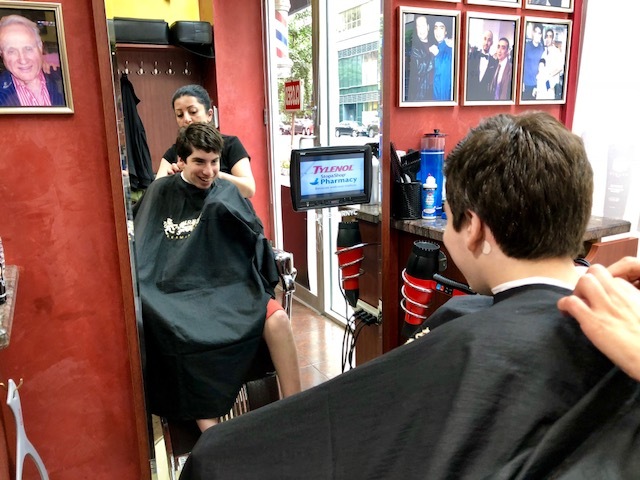 Meanwhile, Max decided he needed a haircut before his steak extravaganza, so I googled a barber shop by the restaurant. We took a taxi there (Max hailed it), and he sat still for the better part of a half hour as the stylist lopped off his mop. This, too, was major progress—haircuts used to make him wail. Max looked pretty suave when we arrived at the restaurant. 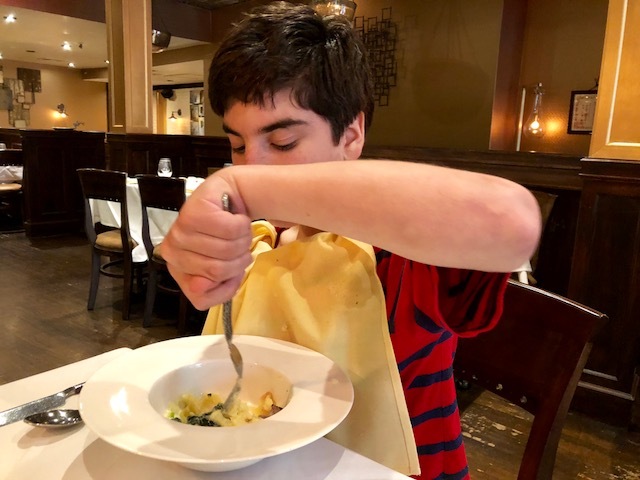 He ordered creamed spinach and mashed potatoes with his steak. I cut it up into pieces and he dug in, happily. We chatted about the end of school and summer. "When You Wish Upon a Star" came on the instrumental music playing in the background, and his face lit up. Then the waiter gave me a glass of Pinot Grigio on the house. Bonus! It was a great day, and not because of any planning I did—it was all Max. As is often the case, there was an extra layer of awesomeness because I was so aware of Max's progress and maturity. As we walked around, I'd held onto his arm, in part because I wanted to make sure he didn't trip. He's pretty steady on his feet but uneven pavement can mess up his balance. At some point, Max broke free. "No, thanks!" he said. And we walked on, just any mom and teen enjoying a day together. What a great day! Thanks for sharing. He is SOOOO grown up.